Not all biker dating websites are strictly about dating. In fact, BikerOrNot.com has created a site that is more for socializing than it is for dating. It acts as a social network for bikers; however, many single bikers do use the site as a dating site to find other single bikers. That is why Biker Or Not makes our list of top biker dating sites. No matter where you live, what type of bike you ride, or whether or not you belong to a biker’s club, you can use Biker Or Not to make friends, keep up-to-date with events, partake with like-minded people in various groups, and even find someone interesting to date. And you know what they say – friends often make the best lovers. Find a friend on BikerOrNot.com and there is a chance that it could turn into something more. Sign up is easy and straightforward. You can also sign up by connecting with Facebook. There are sections to choose your relationship status as well as your riding habits. Don’t be scared to be honest in these sections as it will help other members get a feel for who you are. You must fill out these sections to continue. Also, you must validate your email before you can look around Biker Or Not. One of the best things that happened during this review was finding out that there was no cost to join and use the features on this site. We like that! 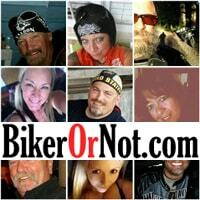 BikerOrNot.com is a social network where you can browse and interact for free. However, there is a store where you can buy products from many categories, including jewelry, shirts, patches, and eyewear. Just like in other social sites, there is a relationship status section in your profile, and this makes it easier to find out whether that guy or girl is single or already taken. Moreover, an unusual status that they have is the ability to declare yourself as someone who has an empty backseat or someone who is looking to ride on the back of someone else’s bike. It makes it easier to search for members. Note: Members can choose to set their profiles to private, so if you want to connect with someone interesting, you will have to add them to your friends. There is a chat room where you can talk to other members. Your can click on the video icon to stream yourself through video in the chat room, or if someone is streaming their video, you can click on it to instantly watch them. You can also chat on-one-on with other members, which is a great feature to have if you find someone interesting enough to talk with alone. As far as biker features go, there are a few neat things you can do. For instance, you can create a fan page or join another fan page. These pages are based on everything, including biking, dating, music, famous celebrities, tattoos, websites, and more. In other words, it is an excellent way to connect with other like-minded members. Inside the fan page, you can post comments, attach photos, or attach links. Plus, you can click out onto any members profile and check them out. You can also search for events or rides in your area, or create an event for other people to find. If you check out the event map, you will see little motorcycles on the map which indicate where events are being held. Most of the events were being held in the United States during our Biker Or Not review, but that doesn’t mean you can’t add one in your area. The ability to see who is online. A message center where you can send messages to other members and receive messages. Search members according to location, age, and gender. Post comments on other people’s profiles. BikerOrNot.com says that their features are growing daily and that most of them focus around biking. So, this makes it a perfect place to build an active biker community that has its needs met. It is very easy to search members. You go up to search in the top menu and then enter the criteria you want to search for. When matches are found, you can visit their profile by clicking on username, add them as a friend, view their friends, or invite them to an event. During this review, we realized BikerOrNot.com is a lot like other popular social networks, which means it is very easy to use. The top menu gives you access to most of the places you want to be, and the bottom menu gives you access to their blog and FAQs. It doesn’t matter how much experience you have with computers or online, and you will be able to navigate this biker site easily. There is not a lot of need for improvement here. BikerOrNot.com acts like a social network for bikers, and they continually add features to the site, which means that anything you may be missing could be there very soon. Moreover, the owner welcomes any suggestions you may have. But, it was very hard to find a contact address for this site. It is under the privacy link, and it is help[at]bikerornot.com. The only thing they could do to improve the site is that add a forum and an instant messaging capability, this will allow even more activity on the website, and for bikers looking for love, the instant messaging will allow the ability to chat quickly one-on-one in private without having to go to the chat room. As you can see, BikerOrNot.com is a biker dating site, and social network rolled into one. A lot of the members are in a relationship, but there are still a lot of singles on the site. The fact that it costs nothing to join the site and use the features means that you might as well give it a try if you are looking for love. Using their search features, you can find other singles on Biker Or Not who are close to you and become friends with them. Moreover, people can put whether or not they are looking for a relationship in their profile, which will help you determine whether or not they are interested in dating or just connecting before you put yourself out there. With more and more features being added, this biker site is going to keep growing in numbers and popularity. If you don’t meet someone directly through this site, there are plenty of events you can go to and – who knows, maybe the ‘one’ will be attending those events. That means that by default, Biker Or Not could help you find love whether it is directly or indirectly. But, it surely helps in finding friends. How do search just local bikers in my area? To find local bikers in your area, first click on “search” at the top of the page. This will open a short menu, and then you need to click on “users”. After you do that, you’ll be taken to the search options that offer you to search for people by stuff like gender, age, and also city. We suggest you enter the city you’re from (or live close by) then go to “within” field next to it and chose the distance you’re interested in. This should give you a good idea of who’s in the driving range :). Of course, you can also select “Events&Rides” at the top of the page and search for events there. It works a lot like searching for people, and you can meet a lot of cool guys & girls interested in biking this way. We hope this helps and feel free to ask if you have any other questions! I used to have my email & password on my phone. I got a new phone , put in my email address but I couldn’t remember my password so I clicked on forgot password & it gave me a link & when I clicked on it, it said reset your password & then it asked for the old password, as well as the new one plus a confirmation. If I knew the old password I would use it instead of resetting it. BON is a big Joke in my area and if you are looking to meet/date forget it look on — To start off the Men out number the women 10 to 1 and what profiles that are there they are no longer on the site plus what women that are there are in there own little world know wonder most are divorced — They are not looking to meet Blue Collar type guys so you take it from there. Most of these sites are not set up for Blue Collar workers so lots of luck.